Log in to the NCA Tools Website with the credentials supplied to your school (you'll need to contact 0300 303 3013 or assessments@education.gov.uk if you need help locating your credentials). Once logged in you will be able to view the pupil’s test results, and also download the test results in different formats. Follow the onscreen instructions to download the file containing the results (select Combined file containing all subjects and CTF as the file format, then Download). When asked to specify a location where to save this file, save to an area you know you can easily access at the same time as SIMS. On SIMS select Routines > Data In > CTF > Import CTF. Select Add KS2 data for Existing Pupils Only. Only change the matching scale if you have reason to do so (scale 4 is recommended but the default option should work). Click on the browse folder icon in Section 2 - Import Selection, navigate to where you saved the NCA tool download and select the file. If prompted, select On-Roll for Place new pupils in, and leave the effective date as today’s date. Click Proceed For Match Import, check there are no errors (all coloured boxes should be either all green or yellow / green) and then select Import CTF. When your import is complete you will see what has been imported and an Exception log of any issues. 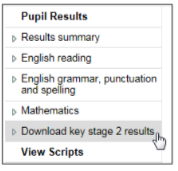 You can now view the data that has been imported by going to Focus > Assessment > Marksheet Entry, searching KS2 and looking at the Broadsheet Review marksheet. The data will be picked up on the next Assembly sync!